Another roadside vendor dish; it reminded me of Falooda. The five star luxury of Hotel Istana was great and the hospitality was superb, but being a typical Bongolander I found the roadside hawkers preparing satay, noodles, cendol, smiling and inviting “Selamat Datang” (welcome) more fascinating. The sights, sounds and smells were definitely more zestful and aromatic. 50g Hoen Kwe (green bean) flour. This is a pre-mixed flour made from moong dal. Palm sugar syrup (Take some jaggery or gur and dissolve in a cup of water to make a brown syrup – you can add regular sugar to make it sweeter). Blend the pandan leaves with water and strain to get the pandan juice. Add pandan paste and blend well. Put the flour and salt in to a pan. Add the pandan juice in (1) and alkaline water. Use a hand whisk to stir well while adding cold water. Make sure the flour is dissolved into a smooth batter. Cook the mixture over a low fire. Keep stirring until the mixture becomes transparent and thick and remove from the fire. Prepare a bowl of cold water. Then you can use a colander or a strainer with large holes and pour some of the mixture onto it. Push the Cendol mixture with a spoon so it drop into the water (if you’ve seen how they make ganthiya or sev at City Hotel or Purnima – you’ll know what I am talking about). Repeat until all green bean mixture finishes. 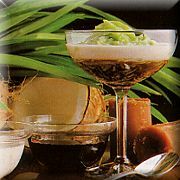 Serve the Cendol in a dessert bowl or tall glass with crushed ice and rich coconut milk and palm sugar syrup. The unofficial “National Dish of Malaysia”. Nasi Lemak is served anytime, breakfast, lunch, dinner, even as a snack. It’s cooked in coconut milk, with pandan leaves, a few cloves, ginger and a stalk of lemon grass. The coconut milk makes the rice texture creamy and fluffy. It is similar to “Wali wa Nazi” but a little more fragrant because of the herbs and spices. Nasi Lemak is available on almost every street vendor and in almost every Malaysian food restaurant. It can be served with everything – from vegetable curry to fish. A perfect companion for the Malaysian Chicken Curry. Wash the rice several times and drain. Add 2 cups of thick coconut milk with screwpine leaves,ginger and lemongrass to the rice. Put some salt (maybe like ¼ teaspoon or less), the oil, and the cloves and cook the rice like you normally do – I leave mine to boil until the coconut milk is almost gone then stir it up, cover it and put it on lowest setting for a few minutes. Usually served with some accompaniments; spicy red hot sauce (sambal), sliced hard-boiled egg and slices of cucumber. This dish is the Malaysian version of Kuku Paka. Tender pieces of chicken delicately simmered in a flavorful coconut gravy. Great with Nasi Lemak or Roti Canai. Place the chopped onion in a food processor together with ginger and garlic and process until smooth. Rub chicken with onion paste and set aside. Heat the oil in a large saucepan, add the remaining sliced onion, cinnamon, cloves, cardamom, and star anise and fry over a medium heat for a couple of minutes until fragrant. Add the curry paste and fry for 2-3 minutes. Add in the chicken and seal on all sides. Add the coconut milk and enough water to cover the chicken by about a couple of inches, bring to the boil then reduce the heat, cover and simmer for 40-50 minutes, add lemon juice, checking the liquid level throughout the cooking time and adding more water or coconut milk if necessary. I prefer the gravy a slightly thicker consistency. You can garnish the dish with some coriander and green or red pepper cut in strips. 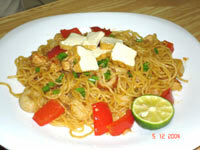 Mee Goreng is noodle dish popular in Malaysia and Singapore. It was probably invented by some desi muhindi who was hungry and decided the Chinese style noodles were too bland for his/her taste buds or was missing some ingredients and so added some curry powder, garlic and chilli (ebu lete pili pili hapa) and the rest is history. Street vendors (mama ntilie) usually make this the best. 1 lb (or 500 gms) “mee” noodles (egg noodles will do but cook them according to the instructions on the packet and drain). 4-5 pcs firm tofu, cut into strips and fried. (optional) ½ lb ground chicken (or meat) marinated in some curry powder. Heat the wok (pan or karai – whatever you prefer) and add about 2 tbsp oil. Add the onion, then garlic. Stir fry until onion is golden and then add ground chicken or meat (optional). Stir fry until chicken or meat started getting cooked (brown), add ketchup, soy sauce and chilli powder. Add tofu, stir fry, then the beaten egg in and stir it into the mixture. Add the noodles, tomato, potato, green onions or chives and mix well. Salt & pepper to taste. Garnish with a lime wedge, the tomato wedges and maybe little coriander. Although you can buy this at an Asian grocery store (or even whip something up from peanut butter), it is nothing when compared to making it fresh. 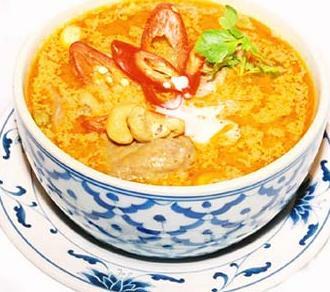 There are many different versions of the peanut sauce. This is the Kajang style (Kajang is near Kuala Lumpur – famous for its satay). You can make it hotter or tangier by adding extra chilli or tamarind juice. Crush peanuts coarsely. Put aside. Chop spice paste ingredients and blend until fine. Heat oil and fry paste with tamarind juice until fragrant on medium high heat. Add water slowly to thin mixture. Add sugar, salt and peanuts and stir frequently for 3-5 minutes. Simmer for 15-20 minutes, or longer, stirring every few minutes until oil begins to separate. Taste and don’t be afraid to add any extra ingredients to make it hotter, sweeter, or tangier – they way you prefer. Serve sauce with sticks of satay and sliced cubes (yes that’s right cubes) of fresh cucumber and red onions. Put flour, salt and sugar in a mixing bowl. Rub in margarine and mix egg and the rest of the ingredients well to form soft dough. Leave to rest for 20-30 minutes. Divide dough into 10-12 pieces. Roll into balls and rub oil or margarine lightly over each ball. Keep the balls in a container and leave aside (just like you’re making chapati or paratha). Grease a marble slab. Press and flatten the balls of dough with your palm on the slab. Use a rolling pin (or your fingers if you don’t have one) to make each ball very thin. Twirl the flattened dough until it becomes thin. Fold the sides to the centre. Flatten the dough again (this is to get the flaky effect). Place on a hot griddle and cook slowly over a low heat. Turn over dough and spread more oil when needed to brown both sides of the roti. 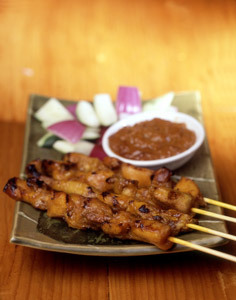 Satay is a Malaysian version of Mishkaki served with a peanut sauce. 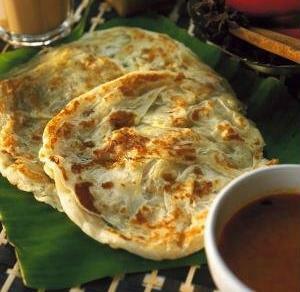 The best place to try this is at the roadside vendors in Kajang which is near Kuala Lumpur (about 20 miles south of KL). Imran told me about this dish and apparently it’s his favorite. I had this in Kajang once and since I was always begging the chefs to make it for me – at the Hotel Istana in KL, they started calling me “Mr. Satay” – they eventually made tons of satay for me. To a heated skillet add curry powder, ginger, garlic and cumin. Cook over medium heat until curry is slightly browned, about 1 minute. Add this mixture to coconut milk in a bowl. Add lemon peel and chili powder. Add chicken. Marinate for 30-60 minutes (more if you want it tasting better). Put chicken pieces on skewers. (You could skewer onion pieces, green pepper, bamboo shoots or mushroom slices.) Grill in the oven (better over hot coals) for about 4 minutes and keep turning them. Serve with Peanut Sauce for dipping.